The front (street side) of Lakeside. The gardens and shade along with the lake breezes help keep that cooler feel. This side view of Lakeside was taken as the sun was setting. The home is shaded and faces west. The massive porch is a great place for family and friends to gather for games or a meal. The view off the wrap around deck towards the lake. Bring a boat, jet ski or just float and use the kayaks. Our spring fed lake is awesome! The Kayaks and other various boats are a hit with our guests. Kids seem drawn to the swim platform. It's great to see them outside enjoying the lake. The Large house in the middle is Lakeside, To the right is Pats Place. 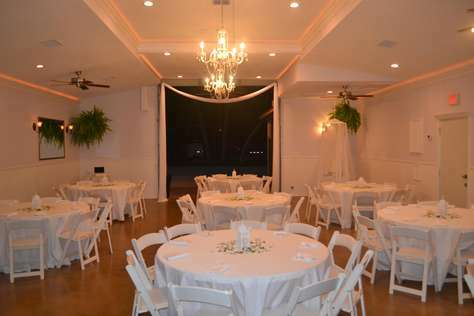 Many people rent multiple homes for larger groups or events. The stone walk down to the lake with a running brook that's pumped from the lake. Sit on the porch and feel the stress melt away. The various decks, docks and covered areas give so many options for finding that perfect spot. 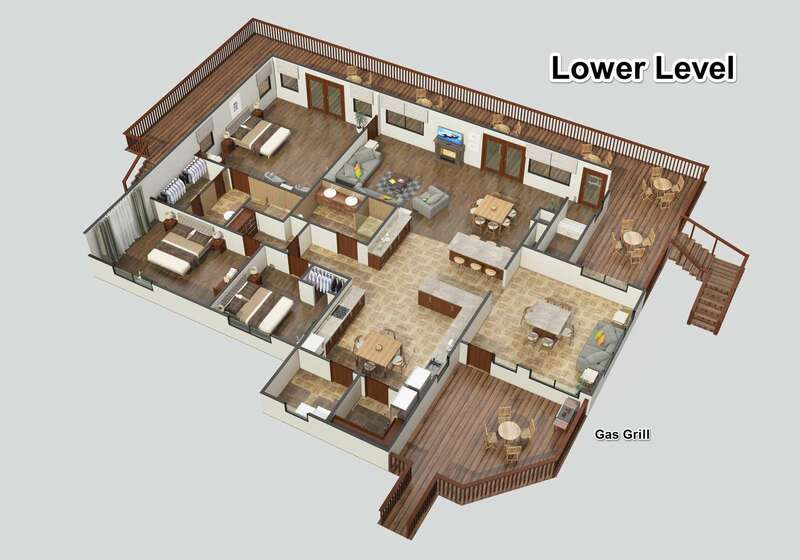 The layout of our six properties. Up the steps and to the left lies the lakeside porch. 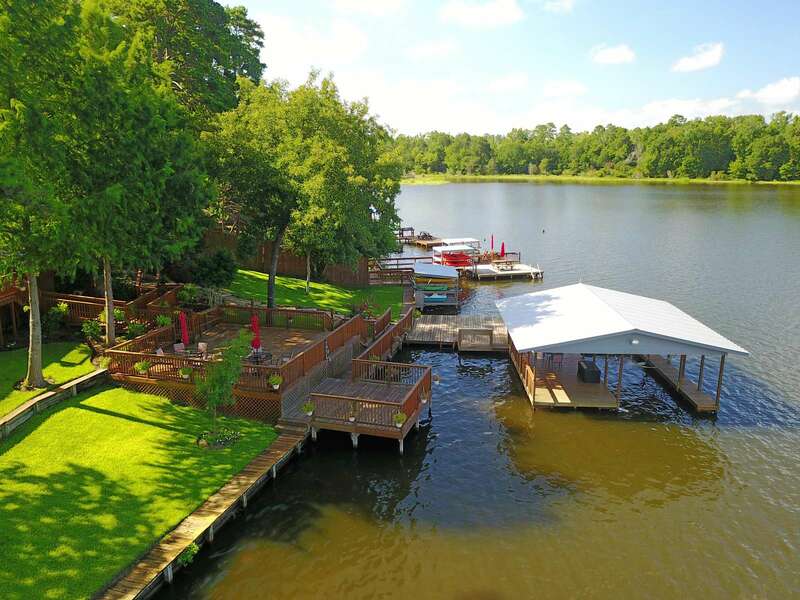 A view of the home and docks from the lake. 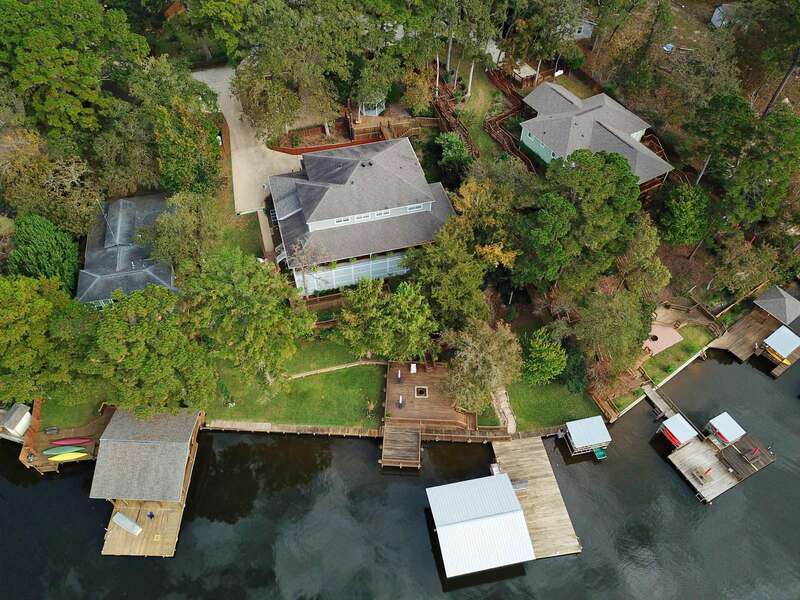 The lower porch (with firepit) and boat dock as viewed from our drone. Walkways and decks are everywhere, along with beautiful gardens. The bridge to the upper bedroom. I could pick from pages of sunsets photos. I just liked this one this day. 🙂 The same deck a little later in the evening. The home and porch with ceiling fans. The sitting area on the dock is a great place to gather. We could go on with outside pictures but lets head inside the home. 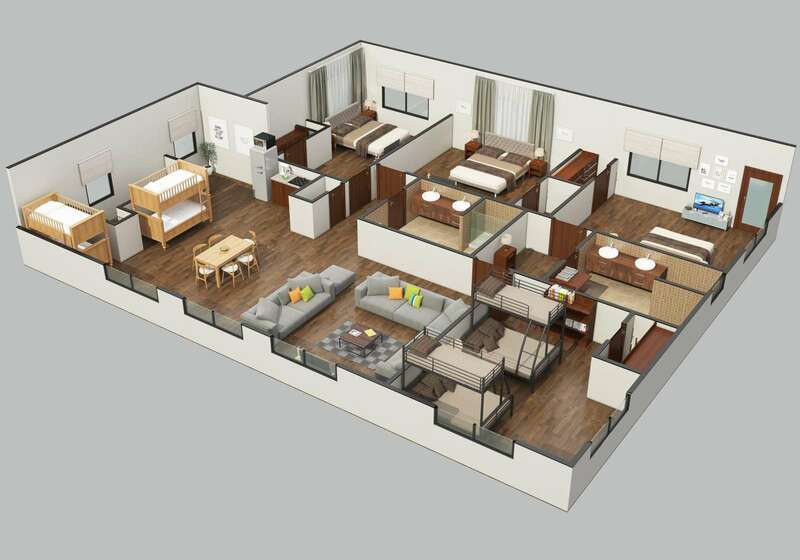 These renderings used with the pictures will help you understand the layout. The bottom of this picture is the road side of the home. The upstairs of lakeside. 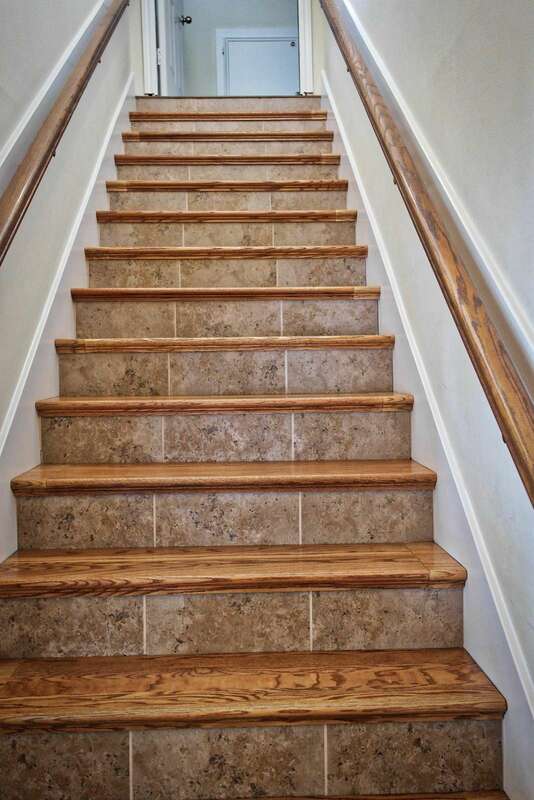 Stairs are upper left. The Lake side is towards the bottom. The entry/setting area. As you'll soon see, there are many gathering spots and places for some "me" time. The well equipped kitchen is large enough to handle your group. Notice the bar stools and table in the kitchen. The light show isn't only outside! The kitchen with table, Kuerig and a good assortment of appliances and cutlery. We have two refrigerators and a large pantry area. The Living Room is adjacent to the kitchen. The television has Netflix and other programs. The Master Bedroom is quite roomy. All our bedrooms have televisions and cable T.V. Looking the other direction in the Master Bedroom. The Master Bathroom. Not shown are two large closets. The lower level left side bedroom (from street side) The same lower level left side bedroom. T.V. and cable in all rooms. The lower level Middle queen bedroom The same lower level Queen room. T.V. & cable The lower hall bathroom. It is very large and has a shower at the rear of this photo. Heading up the stairs to the second storey. The upper gameroom with television and Netflix as well as cable. The other direction in the gameroom. Notice the bunks. The gameroom has a spot for snacks and drinks. The upper right Kind bedroom. (facing from the street) The middle front King bedroom. (facing from the street.) The upper hall bathroom. The shower is behind the wall. The upper left bedroom, also known as the bridge room. Facing from the street. The other direction of the bridge bedroom. Looking out the bridge bedroom to the front gazebo and azalea garden. The bunk room. Full bottoms with twin tops. There is a T.V. and cable. The second upper bathroom. Sinks are to the right behind the door. 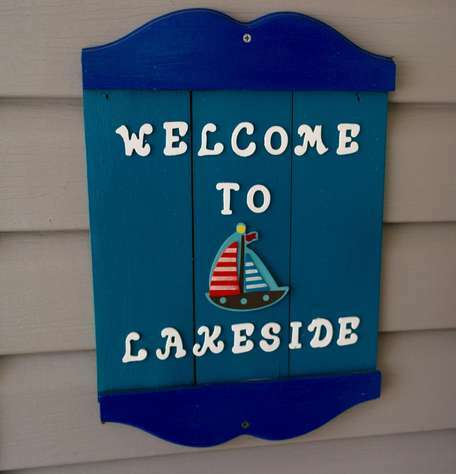 We booked the Lakeside house for a ladies' retreat and had an absolute blast. The owners, Mark and Brenda, were very responsive and helpful when I had questions. The property is stunning. There is plenty of comfortable seating in the house, a huge kitchen with all the amenities you need, and the outside decks are beautiful. Sitting on the decks overlooking the lake in the mornings and evenings was wonderful. The fire pit and kayaks were also great touches, and we got good use out of both. 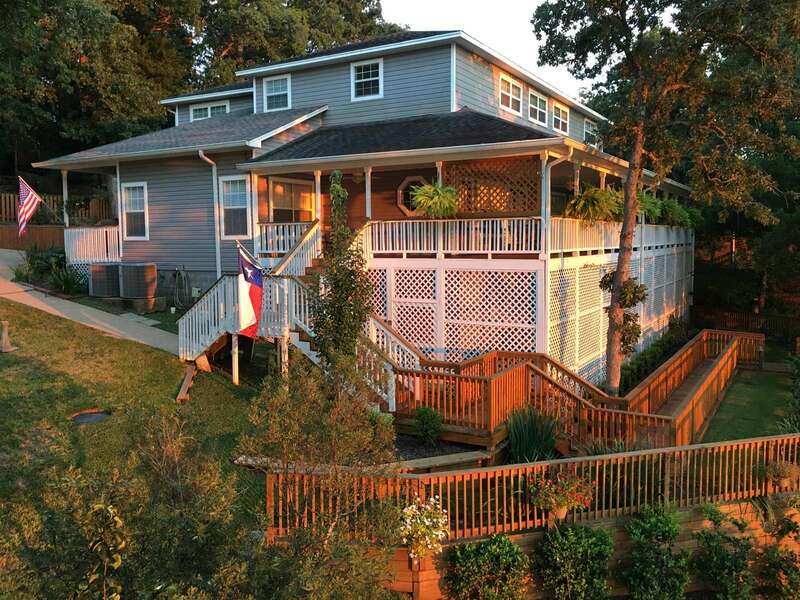 I highly recommend this house for a family reunion, retreat, or trips with several families. We are hoping to return next year. Lakeside was just as described. 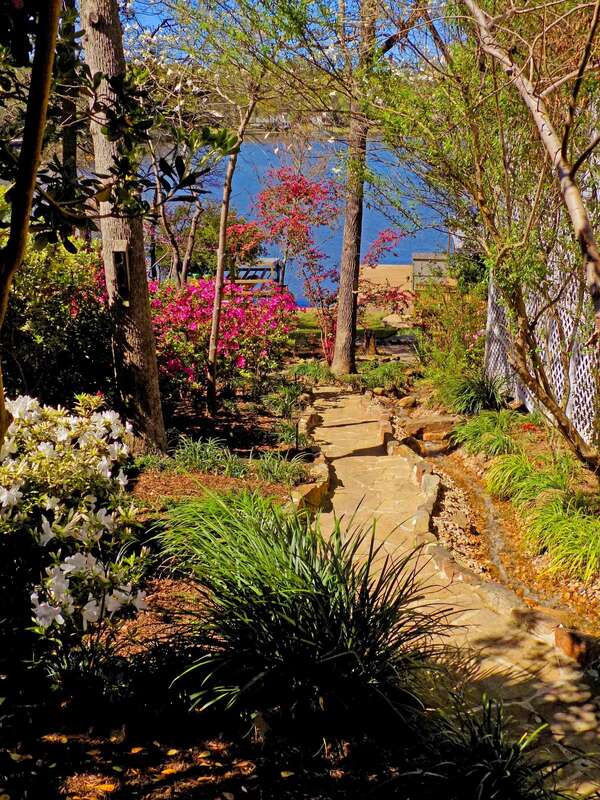 Beautiful lake property with stunning grounds and lake views. 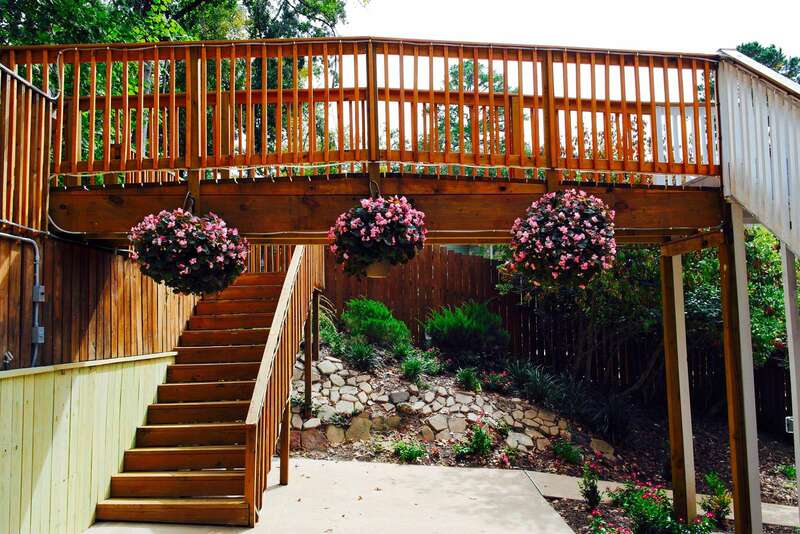 Multi-level decks provide ample space to spread out and enjoy conversation/games. It was on the 'Hot' side on our visit, so we mostly stayed under the large porch with ceiling fans and plenty of tables/seating for our large family. We enjoyed kayaking in the early morning and sunsets in the evenings. The managers were very attentive at making sure we were comfortable and everything we needed. Great trip! 7 bedrooms. Lots of bunk beds for the kids. A massive kitchen with enough room to move around in. The porches ... you gotta see 'em to believe 'em! Great place; you'll never want to leave! The property is beautiful and well-maintained. Nicely furnished. Loved having 2 refrigerators for such a large group. We had ten kids 13 and under and they enjoyed the kid-sized kayaks. They also liked the game room. The only negative was that the showers did not have the pressure I'm used to, but they got the job done. Also, there are a ton of steps gettig to the water, which was not a problem for most. Two people (in 70s) stayed inside the whole time. The Lakehouse and property exceeded our expectations for our family reunion. Not only the Lakehouse but the other three houses which were needed for the entire family. 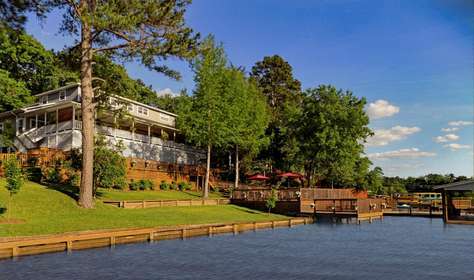 The property is beautifully maintained and provided the perfect atmosphere for us to relax and play in the lake. This spacious house was well stocked with any item we might have needed to use. We ended up bring more items (i.e. skillets, coffee pot, iron, etc.) than we needed to bring. 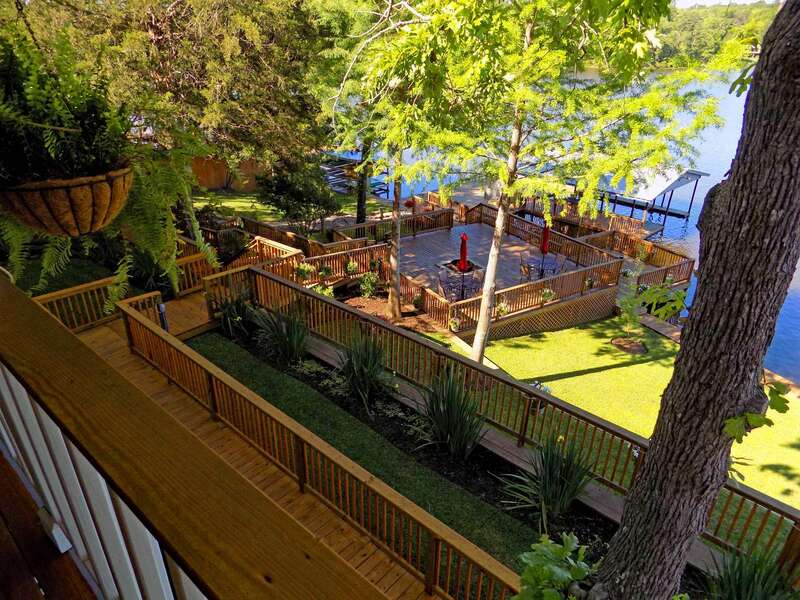 The prime spot to find family was on the wrap around balcony and the decks overlooking the lake. The owners were very gracious, attentive and prompt with any request we may have had. We will defiantly be returning to this location for future events and have recommended it to many friends. Lakeside is an amazing place to relax in luxury. Our family and friends enjoyed their stay so much, we're planning on going back next year and may rent a second home! The staff were very helpful and made sure we had everything we needed. I would highly recommended this place to anyone! The property is every bit of what is shown in the photos, if not more. From the house, the porch, the decks, and the lake itself, this was a great getaway for our entire family, which ranged in age from 6 to 76. I would highly recommend staying here or any of their other properties. They are all well taken care of, and you can tell they put their heart and soul into each one. 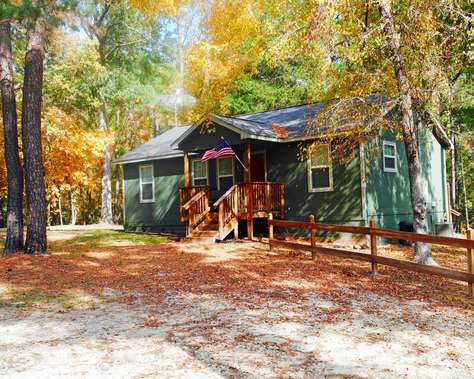 We rented in December and were so impressed we booked for Memorial Day weekend. There was something for all ages to enjoy. Can't think of anything that would make it better. We highly recommend it. We are going to book two house for our family get together this December. not photos that have been doctored to look better. had. (Although the home had many things provided we didn't need to bring along ourselves). Wonderful place to enjoy with an extended family, business group, etc. Our group of 5 families enjoyed this beautifully landscaped and maintained property for 4 days over Spring Break. The house was plenty big for 18 people, laid out well, and very clean. The kitchen was very nice and stocked well with dishes and cooking utensils. We loved the porch across the back of the house which gave us a beautiful view of the lake and a nice area to eat, visit or just chill. We all enjoyed the deck area on the water and were able to keep an eye on the kids as they had fun with the kayaks. The owner and manager were friendly, helpful and nearby if we had any issues. Would definitely recommend this property to others. We rented this huge house for a family get together for my son's birthday. It had so much space that everyone had room to have their own private area and tons of gathering places for family fun. We played board games in the huge dining area, kayaked around the lake, and spent hours around the fire bowl on one of the decks. The kids had hours of fun playing by the rock brook that led down to the lake. Everyone had so much fun that the only time we used the tv was to listen to pandora. The kitchen was stocked so well that I didn't miss any of my tools from home. The owners were attentive answering all of my questions quickly and going out of their way to make out stay memorable. We will definitely be returning to Lakeside. The house is big and beautiful. We have the maximum number of people and still can dance inside the house. 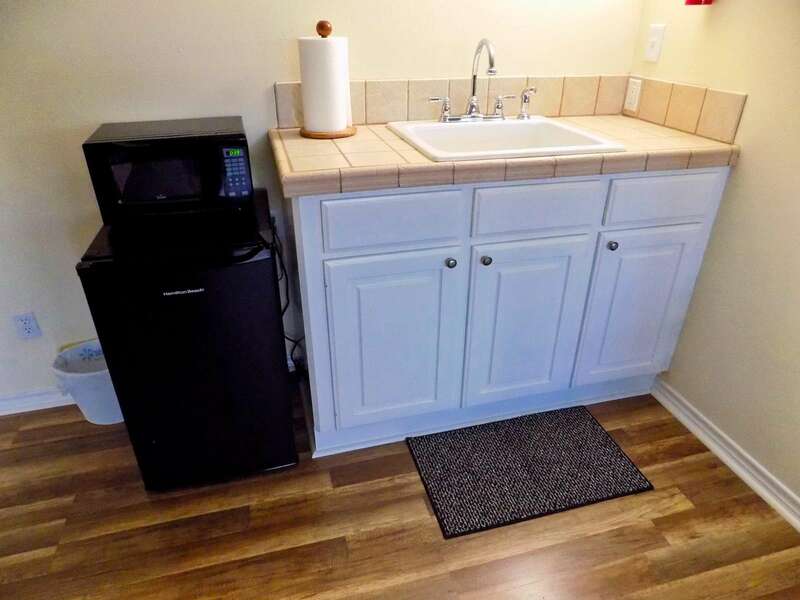 The rooms are clean and the appliances work perfectly. The owner thoughtfully prepared everything we needed for our vacation. We are so glad that we found this place for the group outing. This is the first time we have had kayaks on the site. It is really good and you can go anytime you want. The lake is the perfect size for younger kids kayaking alone, and for nonathletic adults riding it on windy days. At night, we had a camp fire in the fire-pit, heating marshmallows. Everyone had a wonderful time. Thank you Mark and Brenda! We had a great weekend at Lakeside. Our party was 6 couples and everybody loved the house. We enjoyed cooking in the spacious kitchen and eating in the terrace overlooking at the lake. We went kayaking and had a very nice bonfire at night in the beautiful deck. The house is very big and modern and has a lot of amenities. The bedrooms and bathrooms are huge and neat. Mark and Brenda were very nice and helpful and we also liked the property manager who maintains the facility clean and beautiful. We definitely will book this house again! Exceeded Expectations: Our group stayed at Lakeside and Henry's Hideaway. Both houses were very nice, clean and well kept. Lakeside provided more than enough space for our large group. The views of the lake were amazing even from inside the house. Lakeside was thoughtfully designed and our guests were able to enjoy the sunrise/sunset even while preparing meals from the kitchen. Both homes had a lot of extra amenities to make our stay and experience feel like home. Everyone had a great time and hope to come back again. The owners were very accommodating and communicated with us promptly. The onsite property managers were very pleasant and were readily available to take care of our needs. What a relaxing weekend and no one wanted the weekend to end. AND for one weekend, those who suffered from allergies from our group were sneezing, coughing, and itchy/watery eyes FREE. Our Annual Sibling Getaway was most enjoyable this year. The lake home was very spacious, clean, well maintained and supplied with most everything needed for our stay. We enjoyed the beautiful outdoor spaces where we grilled steaks, fried fish, and made ice cream. Everyone enjoyed the kayaks and fishing as well as playing washers. There was plenty of room indoors for board games, just relaxing, watching TV, and catching up with everyone and enjoying meals together. We would definitely love to stay there again. The owners were so very nice and accommodating. We had a wonderful, fun, relaxing weekend with our four generations of our family at Lakeside this past weekend. With most of the family coming from the Dallas area, it was an easy drive and convenient for all of us. 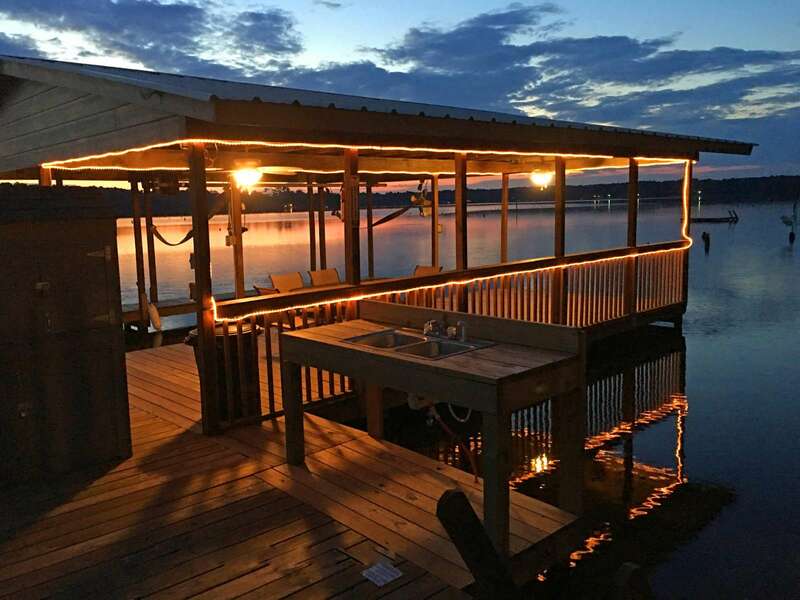 We thought the photos of the property online were great and very inviting but these don't even do justice to the well appointed home with stellar lakefront view. The house was spotless and every detail has been considered. 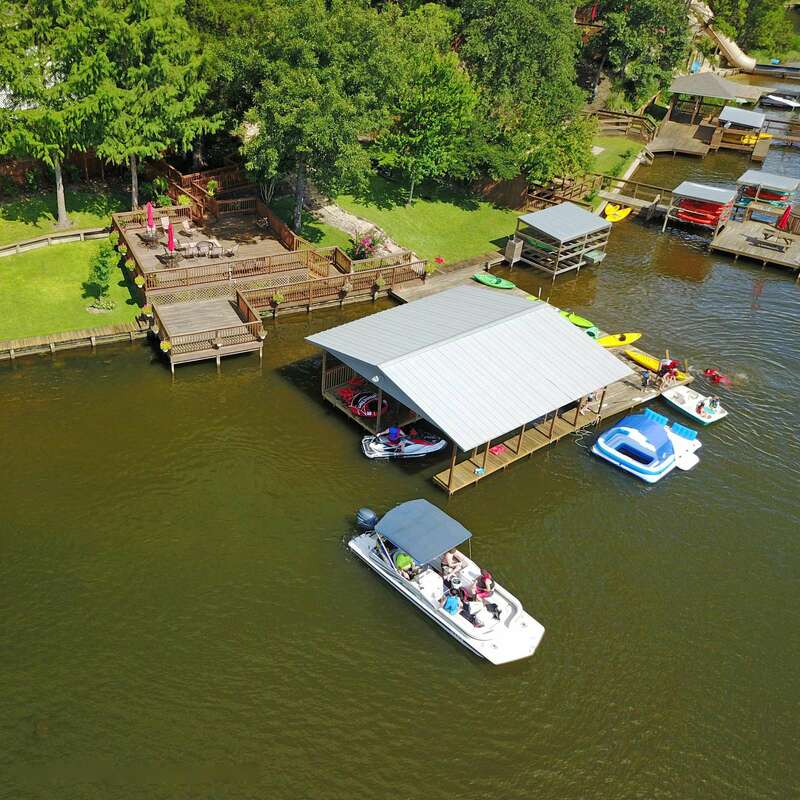 The owners have thoughtfully provided all the comforts for several age groups and our family ranged from 6 to 88 yrs with each person having something to do and enjoying every minute. We were a group of 15 and there was more than ample place for everyone to have adequate sleeping, bathroom/shower time, and move around in the kitchen at mealtime. 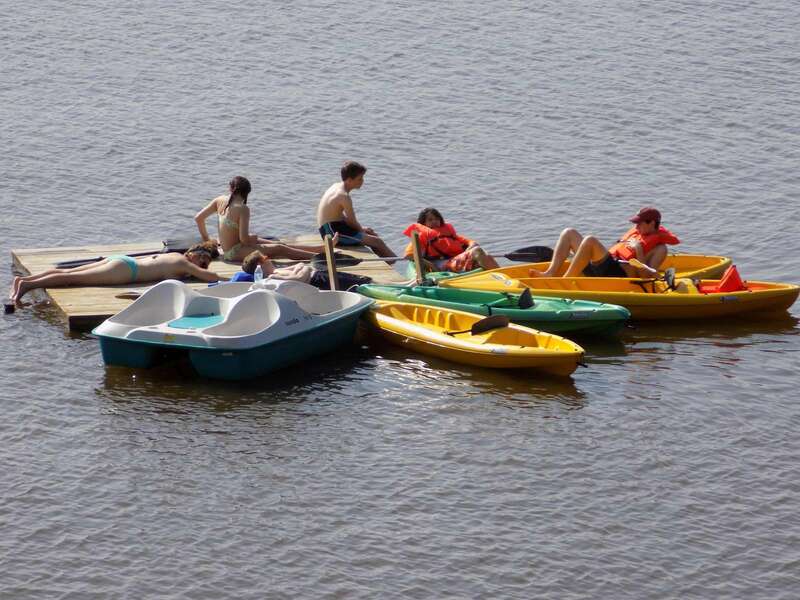 Our favorite aspect was the 6 kayaks and paddle boat provided by the owners. We spent most of each day just floating on our blow-ups around the beautiful big pier/dock as we took turns in the kayaks, paddling around the scenic and very calm waters. We were outside until well past sunset, enjoying s'mores on the mid level deck area fire pit. The house has everything you could possibly need but we definitely brought our own beach towels to have on the dock. There is ample room for those that want to be out in the sun but plenty of shade for some relief from the heat. I can't say enough about how much we all enjoyed ourselves and how lovely this home is. From coffee on the large spacious upstairs deck to watching the Super Moon down on the pier, we lived every moment and will definitely be returning. I booked this house for a church retreat and everybody loved it! The house is beautiful with a lot of space and the deck area is huge. We had a great time using the kayaks and swimming out in the lake. The area is very quiet, and the owners were very helpful. Hope to be back next year! This recently remodeled house in Crockett was beautiful and perfect for our specific occasion. The location of Crockett is perfect for get-away vacations. The massive house is even more impressive in person, with extra space everywhere, perfect for fun games/quality time with friends and family. The path down to the huge dock that overlooks Houston County Lake was amazing in itself. 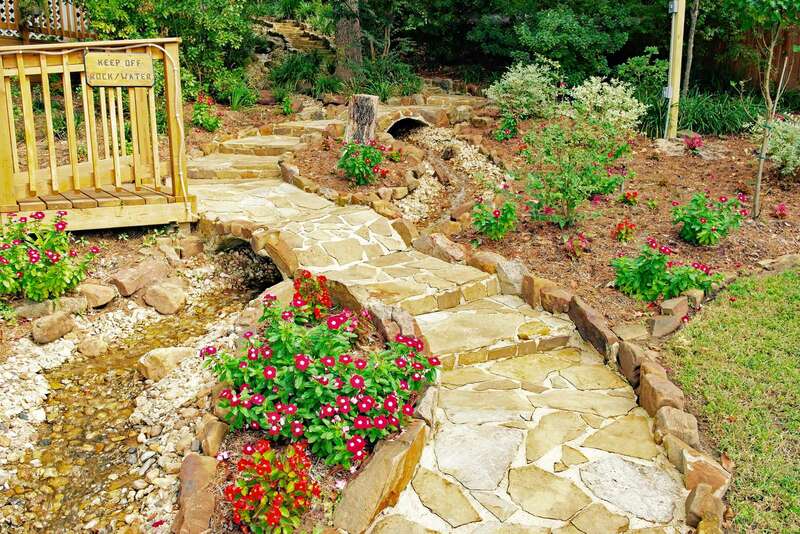 From a gazebo to a concrete path down to the lake surrounded by trees and plants, you're relaxed before you even get to the lake! Down at the lake, fun filled activities await. From kayaks to just laying out listening to music, you can do no wrong. The owners are very easy to work with, excellent at communicating, and willing to help with whatever you need. 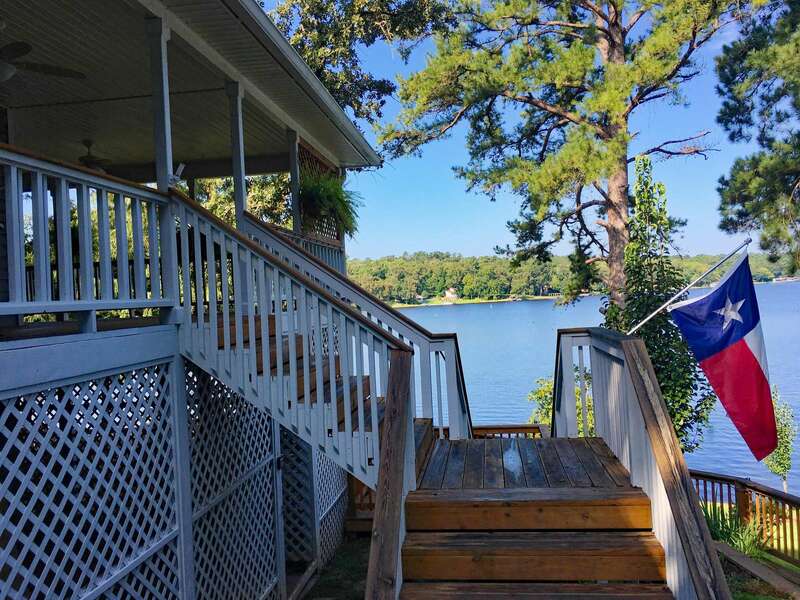 I would highly recommend staying at this house because 1) it's beautifully set up 2) the lake is a perfect size to lay out or kayak 3) why go to a beach when you can go to a lake and not have to worry about the nasty sand?? 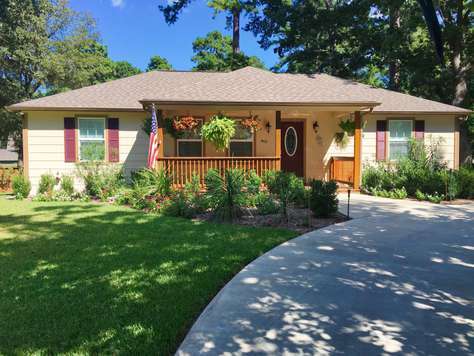 (especially Galveston... yuck) and lastly 4) the property is very well-maintained and you can tell that the owners have put alot of time into making this house as good as it can be. 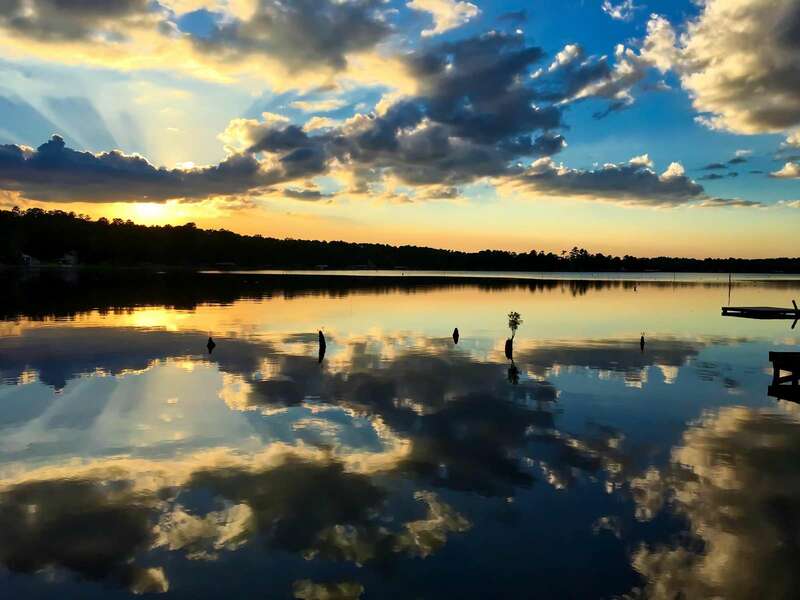 If that's not enough reasons for you to take a trip down to Crockett, Tx, then you aren't ready to relax in the perfect spot! !